If you want the best free web monitoring app, you can forget about Web Monitor. Although this application does claim to be the best free app to offer you “insightful reports of who’s tracking you,” we have found that this is an adware program identical to WebWatch. That means that instead of showing you the promised reports and blocking bad websites, you will be bombarded with useless third-party advertisements that might actually take you to unreliable websites. Having this adware on your PC might expose you to schemers. Therefore, we advise you to delete Web Monitor. However, if you want to make sure that there is no other infection on-board, you should use a malware scanner and take care of all the threats it may find. 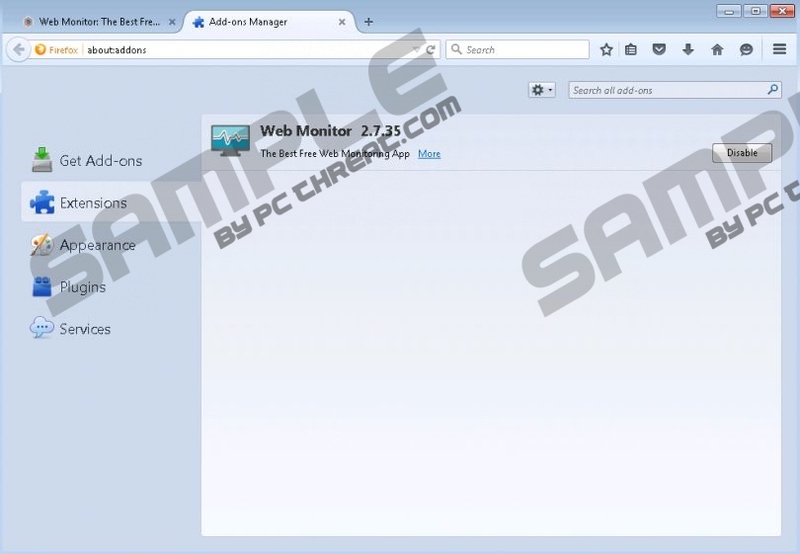 Web Monitor is available for download from its official website at getwebmonitor.com; however, you may be surprised when you click the download button; mostly, if you have an active security tool running in the background. It is possible that both your browser and the tool as well will block your download attempt as they detect the installer as adware. That should be a convincing sign that Web Monitor may not be what it wants you to believe it is. Since the number of computer users who may find this website might not be enough for this adware to generate decent revenue for its creators, they had to figure out another way to spread their product. That is why you can find this adware in free software bundles packed with other malware infections. Users can download such bundles mainly from shady freeware and torrent websites. Those are full of questionable third-party ads and links. If the site is unfamiliar to you, it is easy to click on something that looks like a download button and end up downloading a whole bunch of infections instead of an authentic free program. What most users may not realize is that they can actually say no to the additional components when installing a package. Well, at least most of the time. Obviously, the installers use misleading tactics to make sure that all or most of these infections land on your computer. But, if you are careful enough, you can opt out in time. Web Monitor claims to be a browsing protector that can present you with data on who is tracking you and what kinds of services the visited websites plant in your browser. But we have found that these services may be unreliable. There is only one reliable thing about this useless application and that is the fact that it will display annoying and distracting third-party ads on your computer screen. Do not ever click on those if you do not want to end up on potentially unsafe websites. Doing so could get more infections onto your computer or you might even get scammed by criminals. We hope that it is clear now why we believe that keeping Web Monitor on your system is not an option if you take your virtual security seriously. Removing Web Monitor will not take you more than a minute. Simply identify the application in the installed programs list in Control Panel and uninstall it. Does that sound easy enough? If not, please follow our guide below this article. However, even if you get rid of this worthless adware program, it does not mean that your computer is all free of infections. That is why it is worth checking it by running a free online scanner, for example. If that finds any threat, you can still download and install a reliable antimalware tool to handle the system security issues. Select the application in the list and press Uninstall. Press Win+X and go to Control Panel. Quick & tested solution for Web Monitor removal.